Could the next Usain Bolt hail from Africa? In celebration of the end of the Athletics season (the final Diamond League meet is in Brussels tomorrow! ), I would like to share with you my latest article, Could the next Usain Bolt be from Africa?, which was published in the Mandate Men’s Conference Magazine released yesterday, for the ongoing Mandate Men’s Conference at Jesus House in London. Everyone has been asking me when the Making of Champions documentary will be released – for now, all I can say is that I hope to be able to make a definitive announcement about this in the next couple of months. The project was initially envisioned as a 4-part series, or as a one hour or feature length film, but we are currently starting conversations in Nigeria about converting it into a full season show, such has the project grown over the 9 months we’ve been shooting! So please do bear with us, and I hope to bring you some good news about Making of Champions soon! I think that this article is a very nice way to summarise the progress we’ve made since we started this project, and a great way to wrap up the season, especially considering Mr Bolt’s comments yesterday at the Brussels press conference, confirming that he intends to retire after the 2016 Olympics (assuming he continues to dominate until then ofcourse). Considering the Jamaican conveyor belt of sprinters, with the likes of Yohan Blake, Nesta Carter, Nickel Ashmeade, Warren Weir and Kemar Bailey-Cole all waiting in the wings, the next Usain Bolt is odds on to be a Jamaican – but could Africa bring itself into the conversation by 2016? Read on – only time will tell! Last year I was one of millions who desperately tried – and failed – to purchase tickets to witness the action in the Olympic stadium. I even flew in from South Africa, my base at the time, just to be present at the Games, but had to be content watching most of the action on TV. If my disappointment was not complete seeing the USA men’s basketball team set a points record against Nigeria, it certainly was when the Games ended with Africa’s most populous nation (Nigeria has 170 million people) not winning a medal of any colour! It got me wondering why a nation of such obvious natural talent was seriously under-performing on the global stage. Rewind a few years to my very first memory of athletics. It was the historic 100m final at the 1991 World Championships in Tokyo. For the first time in a race, six of the eight participants finished under 10 seconds, with Carl Lewis claiming a then-world record of 9.86 seconds. I have followed subsequent World Championships and Olympics with great interest ever since. Growing up it was normal, even expected, to see sprinters from my home country, Nigeria, in the 100m finals. Barcelona ’92 featured two Nigerian men each in the 100m and 200m finals. 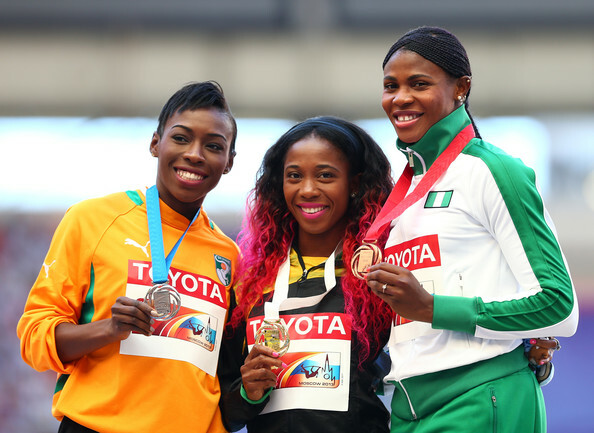 Atlanta ’96 was even better for Nigeria, with Chioma Ajunwa winning Nigeria’s first gold medal in the Long Jump, and Mary Onyali and Falilat Ogunkoya attaining bronze medals in the 200m and 400m respectively. Fifteen years on, the world of athletics looks very different. Jamaica has catapulted to global attention through the likes of Asafa Powell (the first Jamaican 100m world record holder) and Usain Bolt, who holds the current, and staggering, 100m record of 9.58s – a feat that even he may never again match in his career. Interestingly, while Bolt was only the fourth-ever Jamaican to break the ten-second barrier, Nigeria already had eight men who had done it by 2007! More perplexing is that since Bolt’s arrival five years ago, 10 Jamaicans have run sub-10 seconds a combined 170 times, while no Nigerian has accomplished it once! I decided that light needed to be shed on this issue and the perfect opportunity arose when work took me to Nigeria for a 6-month project. Soon after arriving in Lagos, I put a small team together, in my spare time, to shoot the pilot episode of ‘Making of Champions’. We met and interviewed some of Nigeria’s former Olympic medalists, including Mary Onyali, Falilat Ogunkoya and Enefiok Udo-Obong, all of whom we found at Nigeria’s National Sports Festival, Eko 2012. Though it was a decent effort, I quickly realized that, because Nigeria was not currently making any champions, I was going to need something more compelling for anyone to sit up and take notice of the project. So I decided to go to the ‘Home of Champions’ to find out how the best in the world do it. In March I put another film crew together, took a week off work and headed to Jamaica to watch their inter-secondary schools championships, popularly known as CHAMPS, so we could see for ourselves! To gain access to their track superstars, I was fortunate enough to be able to go with one of our past stars. Enefiok Udo-Obong graciously accepted my invitation to make the trip and so we had an Olympic champion, one of the very few that Nigeria has ever produced, on the Making of Champion’s team. It worked like a charm. Within a couple of days we appeared on the morning show on Television Jamaica, which is broadcast to a national audience! This was followed by radio appearances and interviews with several of Jamaica’s stars, including Shelly-Ann Fraser-Pryce and Yohan Blake! The trip revealed that much of Jamaica’s success in Track & Field comes from a culture in which every single child wants to become the next Usain Bolt. The high school CHAMPS is the biggest event in the Jamaican sporting calendar. In which other country in the world could you fill out a 35,000-seater stadium with people of all ages, to watch secondary school kids running? the Bahamas and also went to Portugal and Spain to meet Francis Obikwelu and Glory Alozie respectively. I documented their stories first hand, as both were former medalists for Nigeria in the 200m and 110m hurdles, before switching nationality to represent their adopted countries in 2001. Obikwelu went on to win Portugal’s first and only sprint medal at the Olympics. I also went with Udo-Obong to Atlanta to meet one of the pioneers of Nigerian Athletics: Innocent Egbunike. Still Nigeria’s 400-meter record holder (since 1987), Egbunike coached Udo-Obong and his 4x400m teammates to the gold medal at Sydney 2000, and was Nigeria’s athletics head coach at London 2012. Finally, I returned to the UK to interview several of Team GB’s top stars, many of whom are of Nigerian origin, including Christine Ohuruogu and James Dasaolu! The knowledge that I’ve been able to accumulate on this journey over the last year has inspired me to take action beyond just making a documentary. It is important to note that Jamaica’s emphatic success in the last ten years is not just down to their culture. It came when one coach, his brother and their friend decided to stop outsourcing the development of Jamaica’s young talent to American universities and instead pulled private funding together to set up the first professional track club in Jamaica, MVP. Today MVP is the home of multiple Olympic and world champion, Shelly-Ann Fraser-Pryce, and, together with Usain Bolt’s Racer’s Track Club, has produced the majority of the country’s medalists. I am convinced that Nigeria will not return to its modest heights, or reach the lofty ones attained by the Jamaicans and Americans, without taking ownership of its own development program. There is plenty of talent in West Africa that will never be discovered or developed if no one does anything about it. My desire is to make people aware and thankfully my little savings, coupled with some family support and a lot of creativity, have kept the dream alive so far. External funding may ultimately be needed to bring the documentary to television screens, but we have accumulated so much footage that a full season TV show is definitely possible! Nigeria’s Blessing Okagbare and Cote d’Ivoire’s Murielle Ahoure (both double medalists at the recently concluded World Championships) are testaments of talent existing in West Africa, but both have needed the American collegiate system to begin realizing their immense potential. When will Africa, like Jamaica, stop outsourcing the development of its best talents to America? When will we take action? Only time will tell, but I am hopeful that Making of Champions will not just be a documentary that talks about what needs to be done, but a movement that galvanizes people into action. This is not just about restoring some global pride and glory to a nation and region (which would obviously be nice), but also about materially impacting the lives of people through participation in sports, and thus giving thousands of youths a way out of poverty. After all, there are thousands of footballers in West Africa who may never become football superstars, but just might have enough sprinting potential to be the next Usain Bolt! ← Strategy Session with the Nigerian Sports Minister!